At our annual garden club picnic on a Monday evening, I was introduced to a lady by a friend who informed her I was an expert on whitetail hunting. "I think it's terrible that you hunters kill all those big bucks just to get their antlers," she instantly said. "You are endangering the future of white-tailed deer by killing the bucks that have superior genetics." "As she soon discovered, she said this to the wrong person. "The deer you are talking about," I responded, "are the most elusive of whitetails. They are rarely even seen by most hunters. The average hunter is lucky to take one or two in a lifetime. Most deer harvested by American deer hunters are inexperienced fawns and yearlings. If you were to visit a business that processes deer in the fall, you'd see very few whitetails with impressive antlers. "Whenever an average hunter finally takes such a buck, it is such an unusual accomplishment that that he or she is likely to have it mounted as a reminder of unparalleled outdoor adventure. I see nothing wrong with that. Does, fawns and yearling bucks are rarely mounted, mostly because taking one is not a great accomplishment. 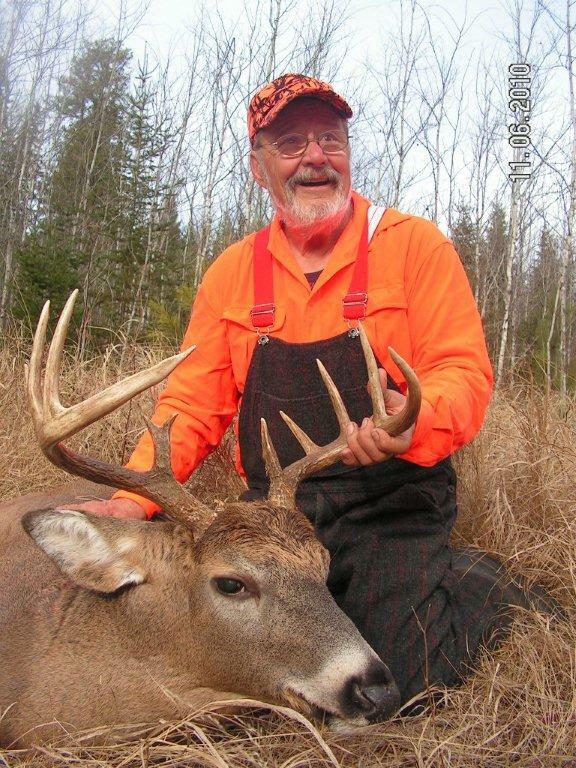 Compared to older bucks, antlerless deer are relatively easy to hunt. Our largest bucks, the most wary and cunning of whitetails, the bucks that survive hunting season after hunting season, the bucks that do most of the breeding, have little to fear from humans. I know this because my hunting partners and I have been studying and hunting such deer exclusively since 1970. I've written nine books about them, based on more than three decades of unique, hunting-related studies of wild deer over much of North America. "My hunting partners and I are not greedy hunters. Skilled as we are, we could easily take up to eight does, fawns and yearlings per hunting season, plus three to four mature bucks. We don't do this because since 1990 the deer of our hunting/study area have never numbered more than 11 per square-mile. Back in the early 1960s, there were 22 deer per square-mile in this region. A series of severe winters in the mid-1960s almost wiped them out. "Gray wolves became protected in Minnesota soon after that devastating loss and their numbers thus began to increase. Whitetails that are slow for some reason—being young, old, sick or wounded—are their primary prey. Each year since 1990 wolves have killed and eaten three of four fawns born in my four-square-mile study area by November 1 (after which time healthy fawns can outrun wolves). "Following a short and mild winter in 2011-2012, all does two years of age or older in this area gave birth to twin fawns. Pairs of their small, identifying tracks were found everywhere in late May. All summer long, however, most wolf droppings found in this area contained undigested deer hair and unstained, unworn teeth and diminutive hooves and dewclaws of fawns. "Throughout the November firearm hunting season that followed, only one of two adult does was accompanied by a single fawn. This is usually the rule in this area no matter how many fawns are born in spring. The hunting area of our resident wolves after they form packs in early November is estimated to be about 100 square-miles in size. Within this area they prey on one whitetail per week (sometimes more), further limiting deer numbers in our study area. Twice since 1990 our deer numbers dropped as low as eight per square-mile. For this reason we do not hunt does, the only deer that can maintain or increase our whitetail numbers. "The trouble is, we like venison, especially venison sausages. We therefore hunt deer, making use of a viable, sustainable wild resource. Twenty-three years ago we adopted a self-imposed limit of three to four bucks 3-1/2 years of age or older with eight points or better. Whenever deer numbers were notably low, 2-1/2-year-old bucks with six to eight points became acceptable quarries. By limiting ourselves to three to four mature bucks per hunting season, we do not significantly effect deer numbers. Annual increases attributable to does are much greater than the number we harvest. Moreover, though we have always managed to take three to four older bucks per hunting season, most of them were non-breeding bucks that contribute nothing to deer populations. Very rarely have we taken more than one dominant breeding buck per hunting season, usually an eight- to 12-pointer weighing in excess of 300 pounds live. three 2012 whitetail bucks. All 3 of these bucks are 8-pointers. This is an example of a 4-1/2 year-old buck from our area. 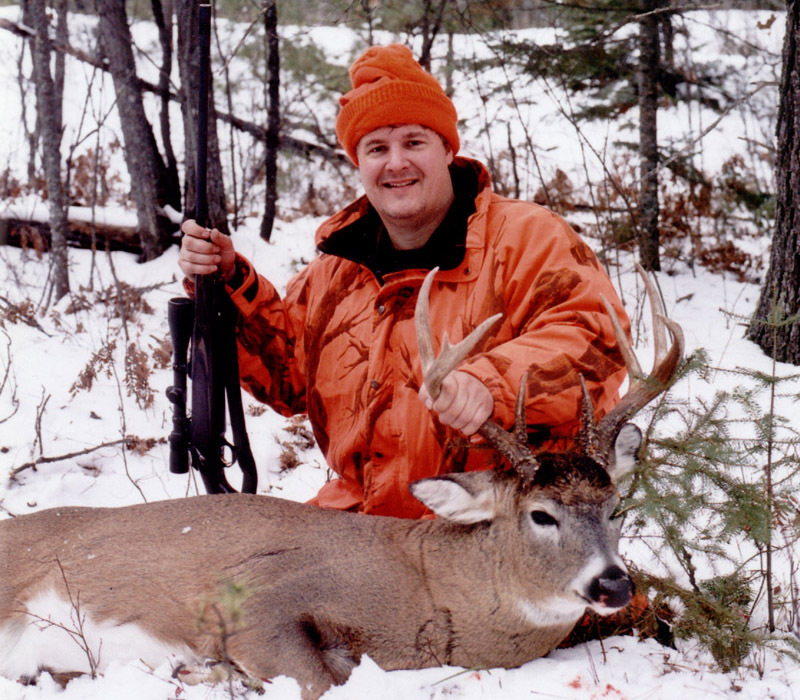 "If we could, we'd hunt 6-1/2-year-old bucks only, deer that are the very best at identifying and avoiding hunters. As soon as these deer realize a hunting season has begun, many begin limiting their movements to nighttime hours only, becoming impossible to hunt. These particular bucks are within a few months of the final days of their lives. In the wilds very few bucks survive their seventh winter, almost all ending up in bellies or wolves and ravens. In 67 years of hunting, I've only taken one that was known to be 7-1/2 years of age. 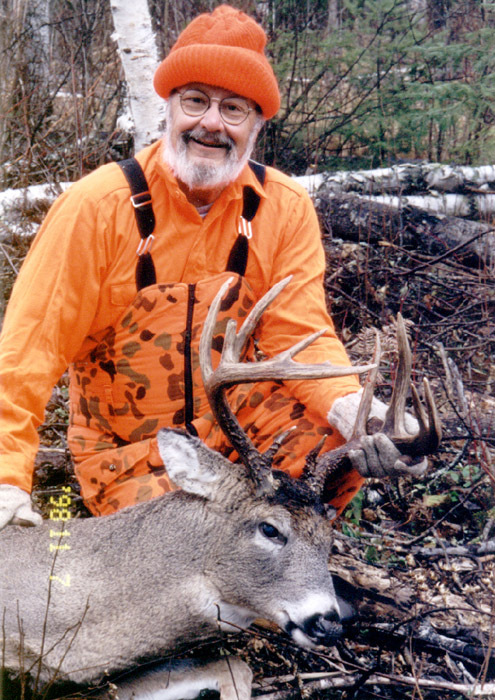 Here is Doc with his Horseshoe Valley, 1998, 13-pointer. (Most likely, this narly old buck was a 7-1/2 year old. 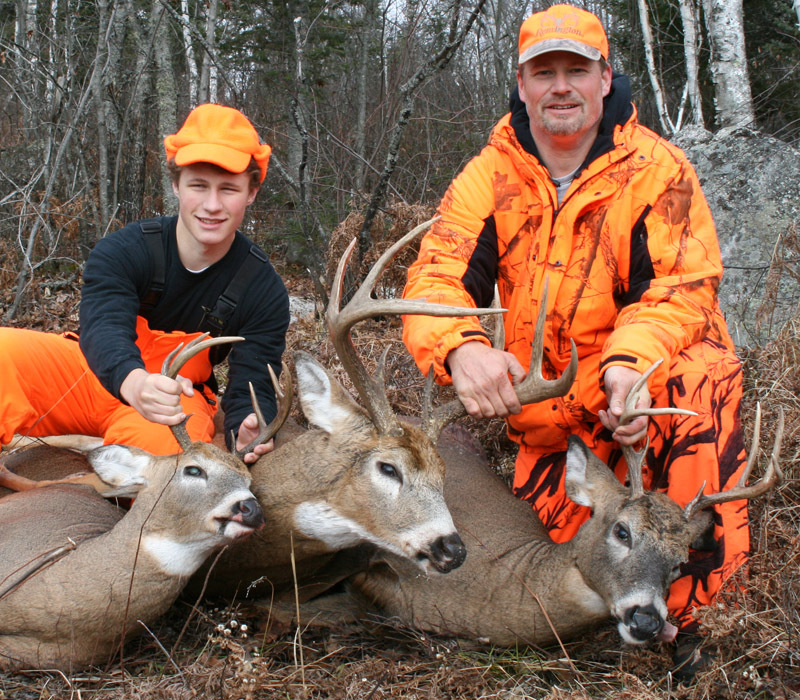 "Each fall there are three to four dominant breeding bucks in our hunting area. Most years each will have a breeding range about one-square-mile in size, each encompassing four to five doe home ranges. Occasionally, one will have a breeding range as large as two square-miles. Typically, a buck one step lower in the local buck pecking order, usually of equal age or one year younger, will quickly adopt the breeding range of any dominant buck that is killed by wolves or a human. Like their predecessors, they keep lesser bucks at bay throughout the primary breeding phase of the rut when most does are bred. It is therefore inconceivable that our hunting does anything to cause the genetics of our deer population to become inferior. "Back in 1990 we realized our self-imposed limit might not be attainable, motivating us to begin a whole new series of hunting related studies. We tried a great variety of innovative hunting tactics, some inspired by our wolves, and we're still at it. The relative effectiveness of a new tactic is determined by numbers of unsuspecting mature bucks seen within easy shooting range (per hunter per day). Our efforts paid off. Despite low deer populations and wolves, we've enjoyed the best buck hunting of our lives throughout the past two decades. "During this period, we began to cherish our wolves. We like hearing them, we like seeing them and we like the affects they have had on our deer. They've made our whitetails extremely wary. "This insures more of our bucks become 4-1/2 to 6-1/2-year-old bucks in their prime. Though mature bucks are much more difficult to hunt than other deer wherever they live, it takes a great deal more knowledge and skill to regularly succeed at hunting them in wolf country. My hunting partners and I have become regularly successful at it because we have put a lot of work and time into improving our hunting tactics (which are completely ethical and legal). "Our buck hunting methods have made it so easy to see antlerless deer and yearling bucks that we no longer consider it sporting to even consider taking one. We just enjoy watching them. Sure, wherever whitetail numbers are greater than the number that can find enough food to survive winter, does must be harvested, the most efficient way to keep deer numbers within the carrying capacities of their ranges, but this is not the case where I hunt. "So now, whatever our reasons may be for hunting older bucks exclusively, please quit thinking badly about the few of us who are more regularly successful at it."